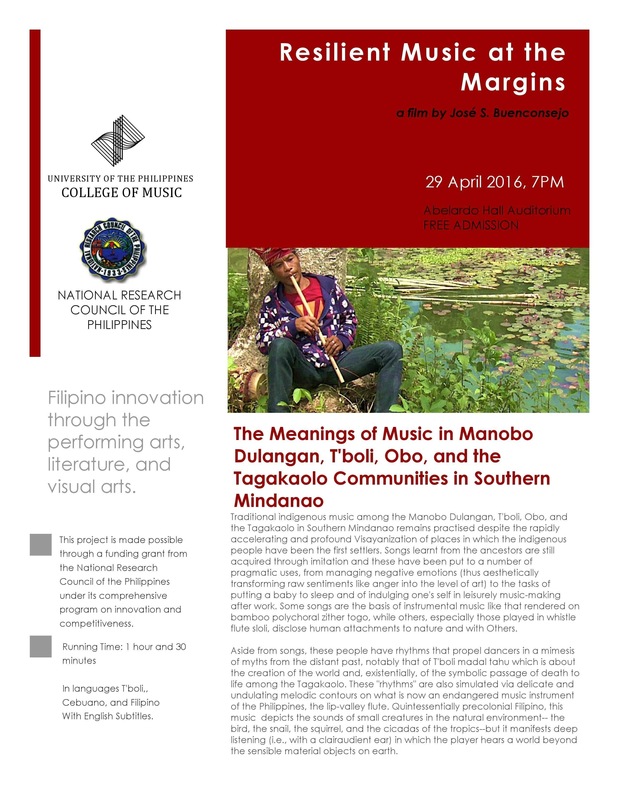 The Humanities Division of the National Research Council of the Philippines, in cooperation with the University of the Philippines College of Music, invites the public to the preview of a documentary film titled The Meanings of Music in Manobo Dulangan, T’boli, Obo, and the Tagakaolo Communities in Southern Mindanao. It will be held on 29 April 2016, 7PM, at the Abelardo Hall Auditorium in Quezon City. This is the first of three films that Dr. Jose S. Buenconsejo, musicologist at UP College of Music, is producing as part of his grant “Resilient Music at the Margins” from the National Research Council of the Philippines in 2016. In the film, indigenous music among the Manobo Dulangan, T’boli, Obo, and the Tagakaolo in Southern Mindanao remains practised despite the rapidly accelerating and profound Visayanization of places in which the indigenous people have been the first settlers. Songs learnt from the ancestors are still acquired through imitation and these have been put to a number of pragmatic uses, from managing negative emotions (thus aesthetically transforming raw sentiments like anger into the level of art) to the tasks of putting a baby to sleep and of indulging one’s self in leisurely music-making after work. Some songs are the basis of instrumental music like that rendered on bamboo polychordal zither togo, while others, especially those played in whistle flute sloli, disclose human attachments to nature and with Others. Aside from songs, these people have rhythms that propel dancers in a mimesis of myths from the distant past, notably that of T’boli madal tahu which is about the creation of the world and, existentially, of the symbolic passage of death to life among the Tagakaolo. These “rhythms” are also simulated via delicate and undulating melodic contours on what is now an endangered music instrument of the Philippines, the lip-valley flute. Quintessentially precolonial Filipino, this music depicts the sounds of small creatures in the natural environment– the bird, the snail, the squirrel, and the cicadas of the tropics–but it manifests deep listening (i.e., with a clairaudient ear) in which the player hears a world beyond the sensible material objects on earth.